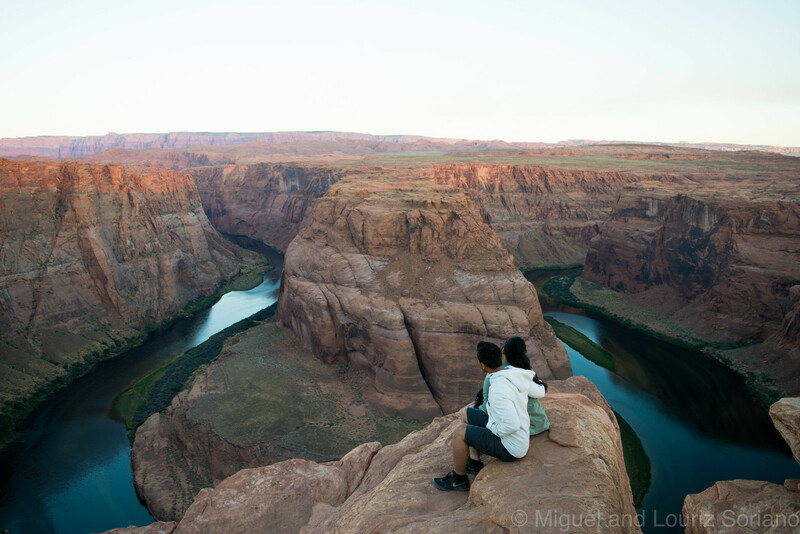 One of our must-see’s on this trip was Horseshoe Bend in Page, AZ. We specifically wanted to see it at sunrise – which, as we researched beforehand, on July 13, 2016 was at 5:17 AM local time. Now for a story. We were scheduled to leave Zion National Park at 3:30AM thinking that we had 1 hour and 45 minutes to get to Page, AZ just in time for the sunrise. We woke up at 3:15AM. Have you ever tried dismantling a campsite at 3:15AM? In the middle of a gusty canyon floor? With only flashlights on hand? Not fun. Kind of scary. Anyway, even though we stumbled in the dark as fast as we could, we didn’t leave camp until after 3:45AM. By then we realized that our fastest, most-direct route was going to put us on a steep, narrow road up and out of the canyon. 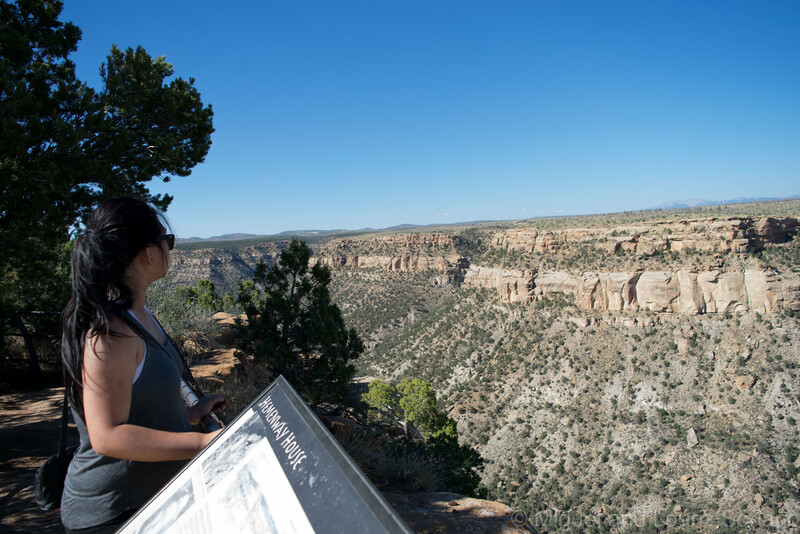 The whole time we were moving up, we were praying that we won’t make too wide of a turn or that a deer won’t jump out and cause us to veer and fall into the canyon below. Thank God, we got out in one piece. But we had to drive patiently and slowly, significantly slower than anticipated and calculated by Mr. Google Maps. 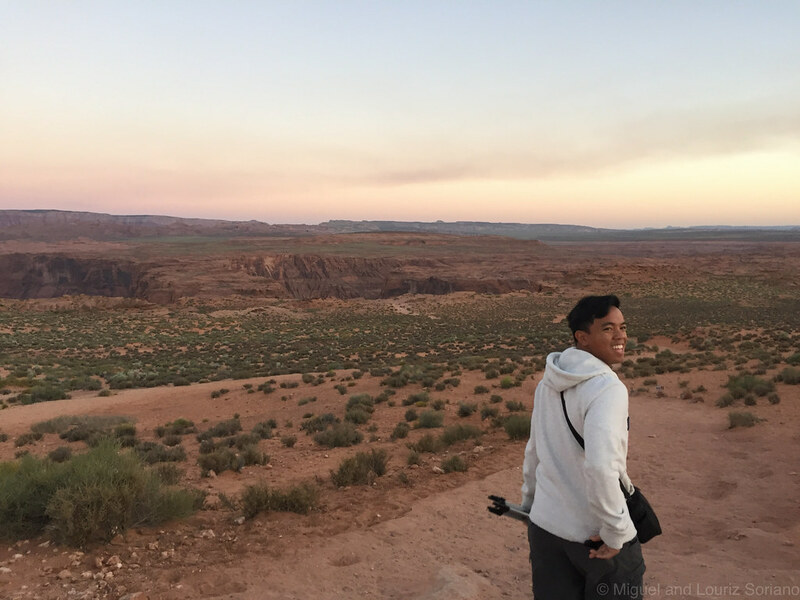 By 4:45AM, we were still in the middle-of-nowhere Utah and I had accepted that we would not be reaching Page, Arizona by sunrise (there’s a point to this story, bear with me). If you are smarter than we were you would have realized as you read that last paragraph that we had forgotten about a little thing called “Daylight Saving Time“. 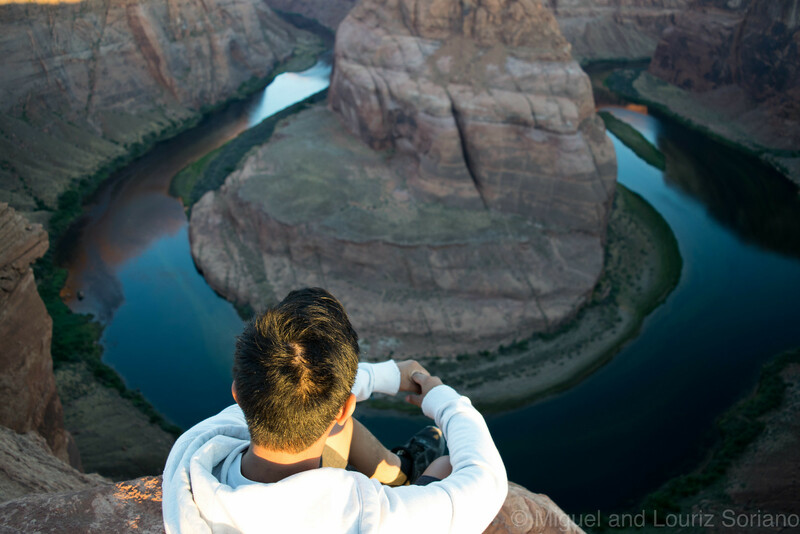 Fun fact: Did you know that Arizona does not observe Daylight Saving Time? Yeah. That 5:17AM was Arizona Time, which was on Mountain Standard Time (MST). 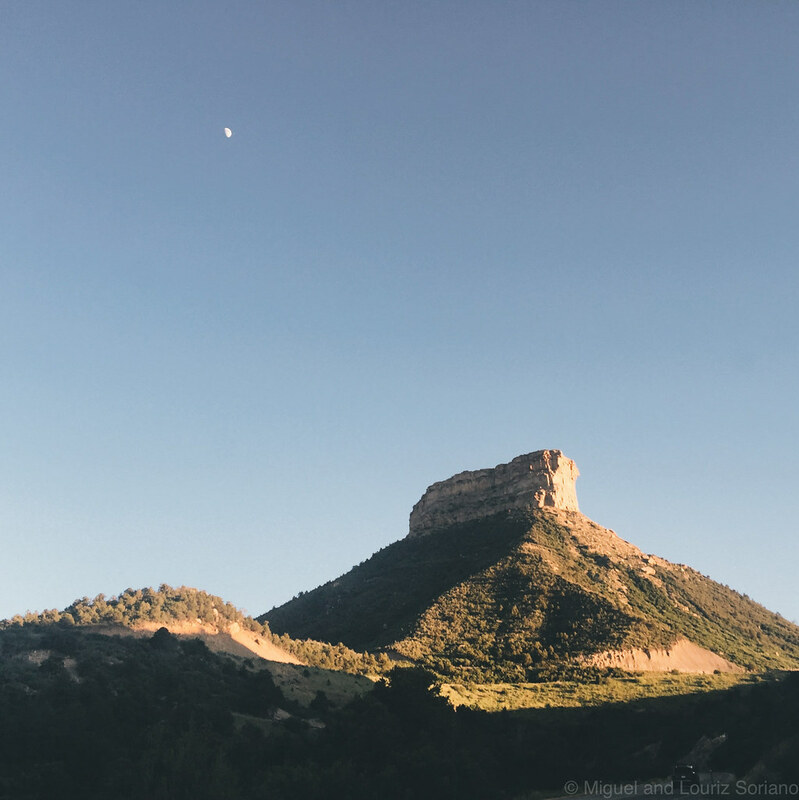 Utah was on Mountain Daylight Time (MDT). That means we actually left Zion at 2:30AM on MST. Ha! We realized our mistake when we neared the Arizona state line and saw our cellphone clocks go back an hour. My embarrassing inability to tell time correctly was rectified by pesky time zone changes. Thanks America! 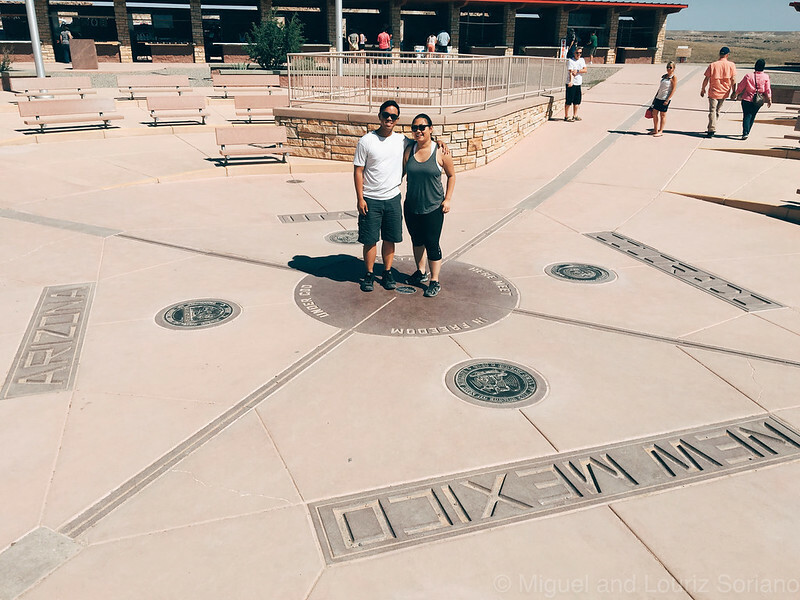 Long, boring and nerdy story short, we made it to Page, AZ around 4:30 MDT. We had plenty of time to grab coffee before heading to Horseshoe Bend. To get to the actual edge of the canyon, one had to hike about 10-15 minutes from the parking lot. It was not a flat hike but not too bad either. 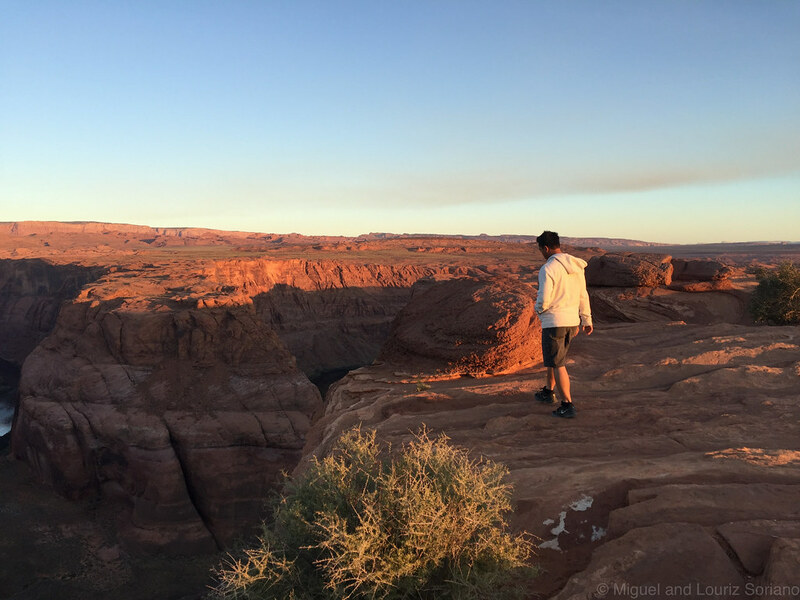 You approach the canyon from atop a small hill then you walk towards it and slowly start to realize how huge it is. There were already a handful of people there, mostly early bird photographers. We are not professionals but we still tried to get some photos for our later and your enjoyment. 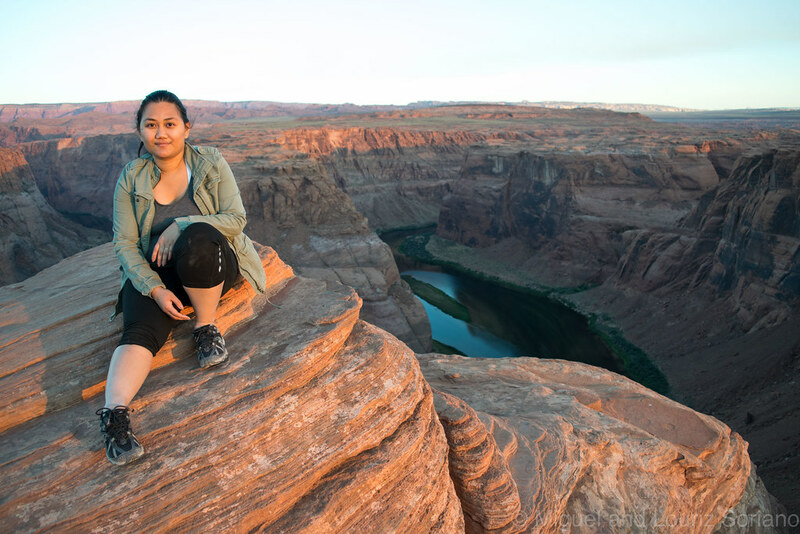 Many people get photos where they are really at the edge with feet dangling freely over the canyon. I’m all for that Instagram shot, you guys, but I couldn’t do it. I’m scared of heights. And it was windy. And I’m not the most agile of people. And I felt like a misstep could send me to eternity… and… and… my heart was pounding so fast. What can I say? I’m a scared y-cat, but I’m alive. I scooched as close to the edge as I could, posed for 30 seconds to have our photo taken and gladly crawled back until I felt safe enough to stand. I’m not exaggerating, I hugged the ground and crawled to safety. Then took more photos. Note the hint of anxiety on my face. 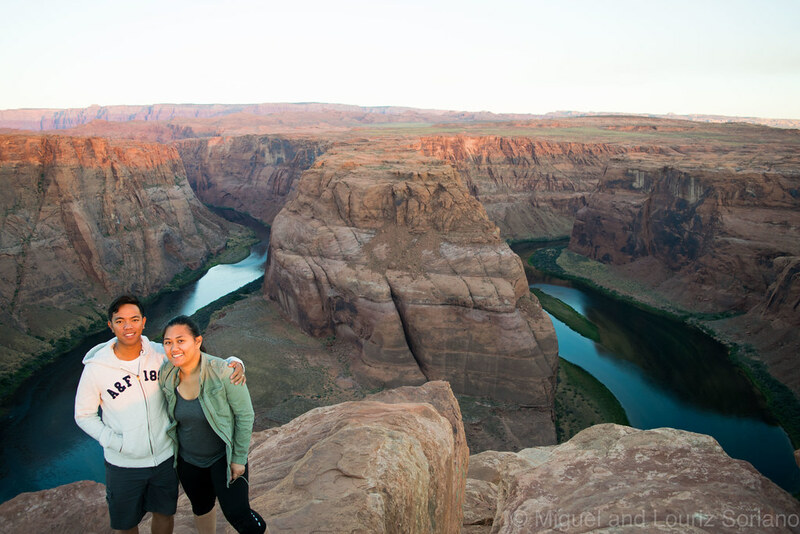 We stayed (at a safe distance from, but still close) at Horseshoe Bend for about an hour, watching the sun rise behind us and fill the canyon with magnificent light. The sight was both dynamic and still. Every few minutes, you stare at it and the light has changed the canyon somehow. Yet at the same time, it feels solid, unchangeable, immovable. It is changing – at what might be literally, a glacial pace. Magnificent. Also filling the canyon were the late-risers coming in little after the sunrise. 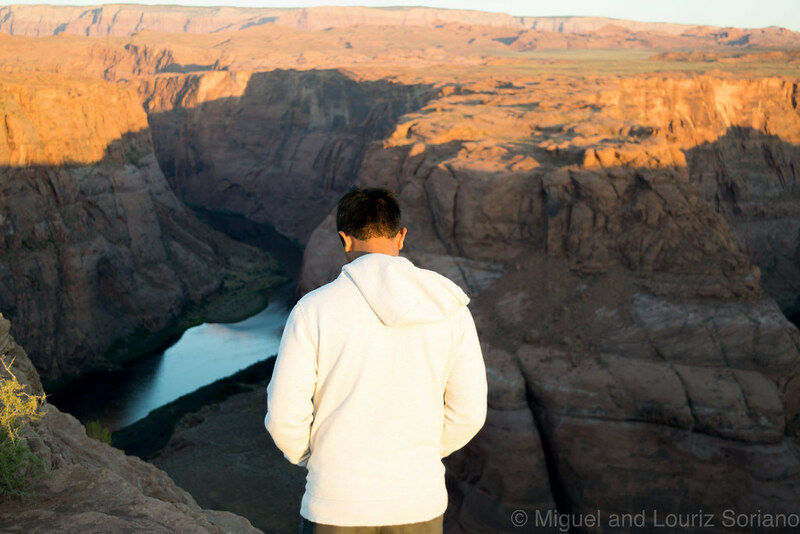 Even with its many visitors, the canyon still felt too big to be overcrowded. Some places just have that effect. After a while, there’s enough sunshine that the scene stabilized. That’s when we went back on the road. 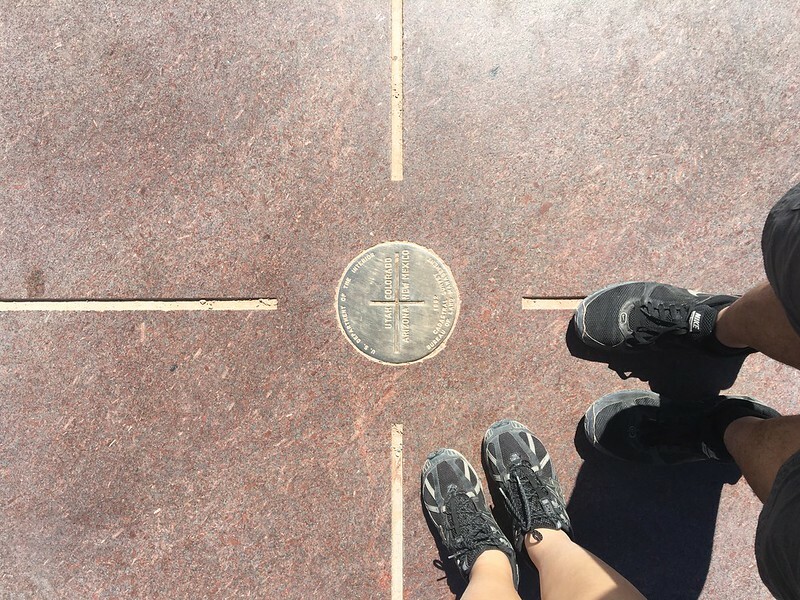 Next on the trip schedule was a quick stop at the Four Corners Monument in, well, literally where Utah, Arizona, New Mexico and Colorado meet. It’s in the middle of Native American land. We paid a fee to enter and took the photo below. Note the high and harsh desert sun flooding our faces. Anyway, it was important for us to hit Four Corners because we just had to twice-up Landon Carter and Jamie Sullivan by being “in four places at the same time”. Yeah, I know right?!? I’m just a generous fountain of useful facts today. You’re welcome. 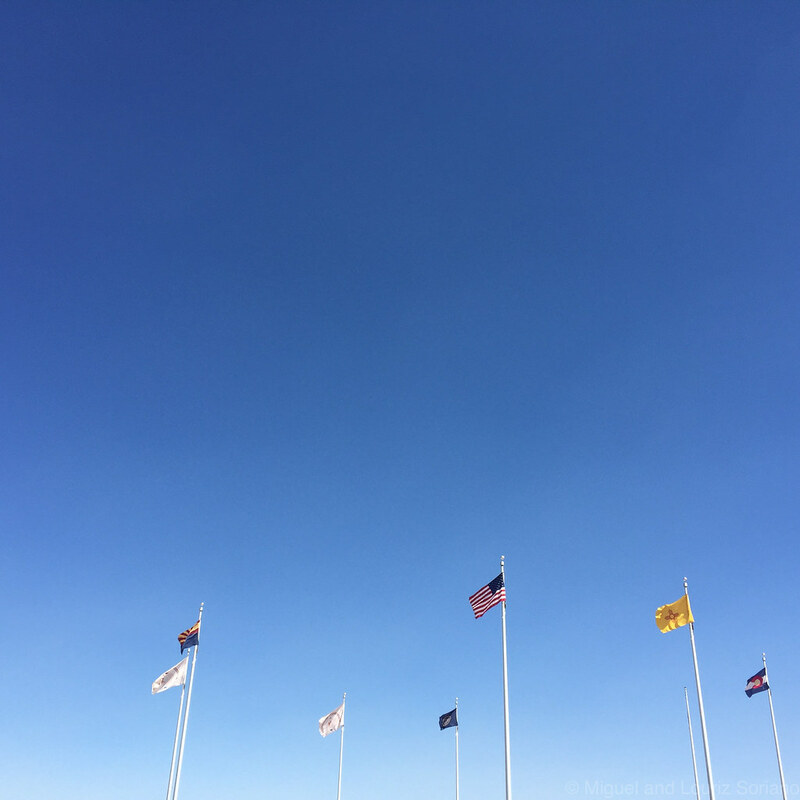 The Four Corners monument feels like a commercial plaza, with souvenir stalls lining up on all four sides. It does feel very tourist-y. Still cool though. 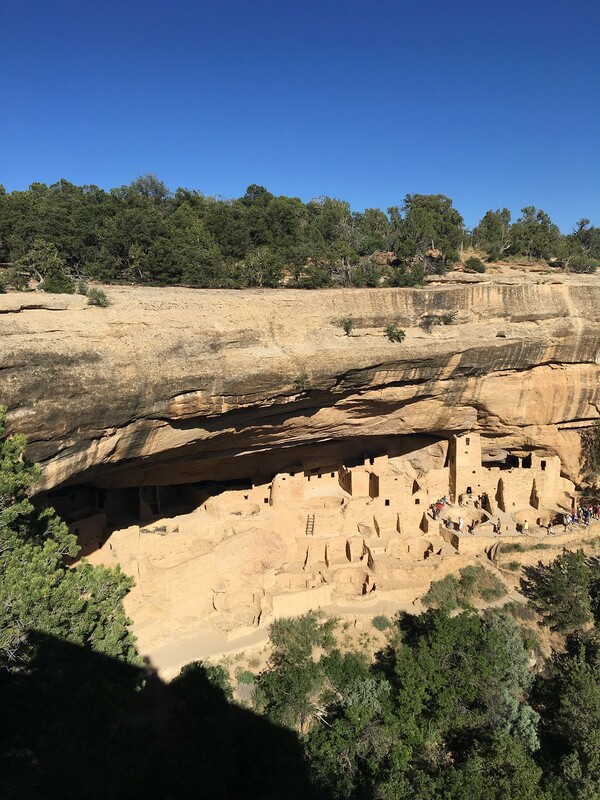 We acted like tourists (because we are) – got our photo, paid (possibly too much) for a nice little souvenir sand-painting and headed northeast to Colorado to see and camp at Mesa Verde National Park. 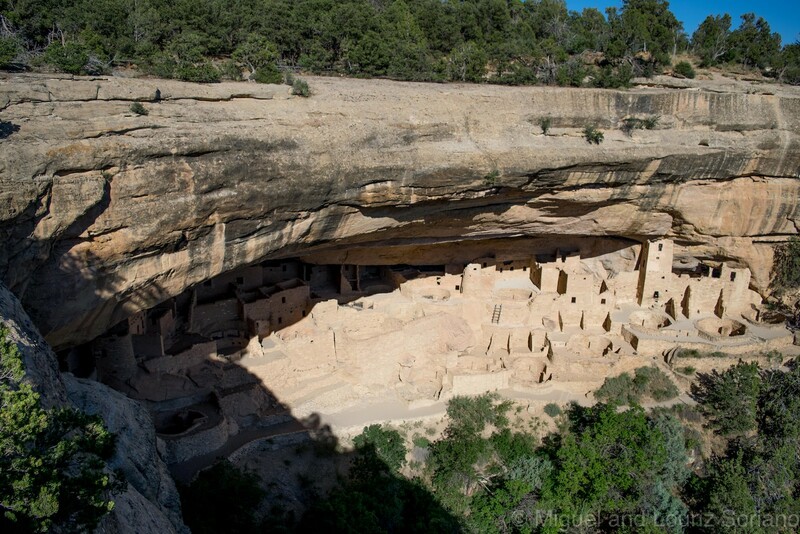 Mesa Verde is known for its cliff dwellings or houses/communes cut out of the side of a mesa, or tableland. 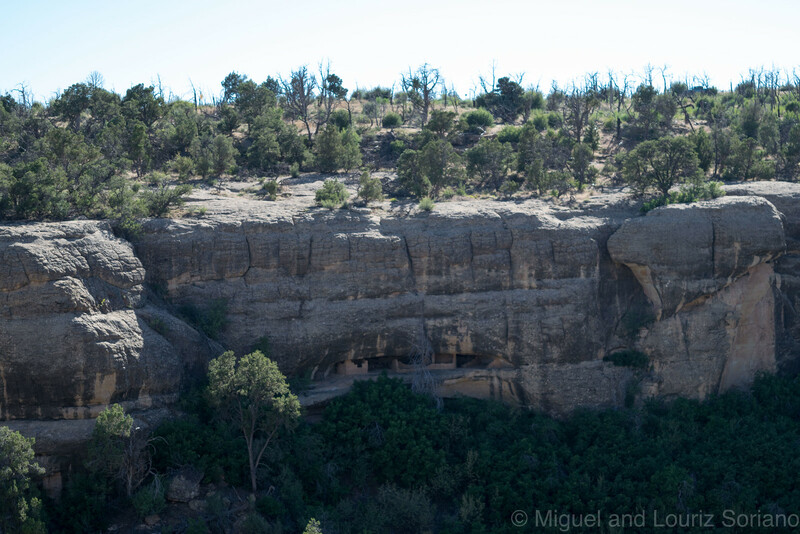 The former inhabitants, Ancestral Puebloans, would farm the top of the mesas and reside in the dwellings below. 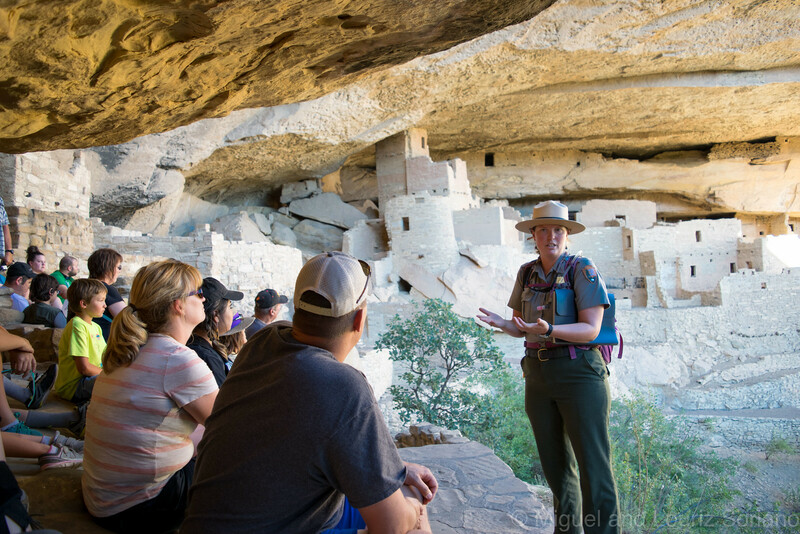 Now there are many dwellings to visit around Mesa Verde. Had we more time and had this been a vacation, it would’ve certainly been worth a couple of days stay. Can you believe that this archeological goldmine is inside the continental United States? 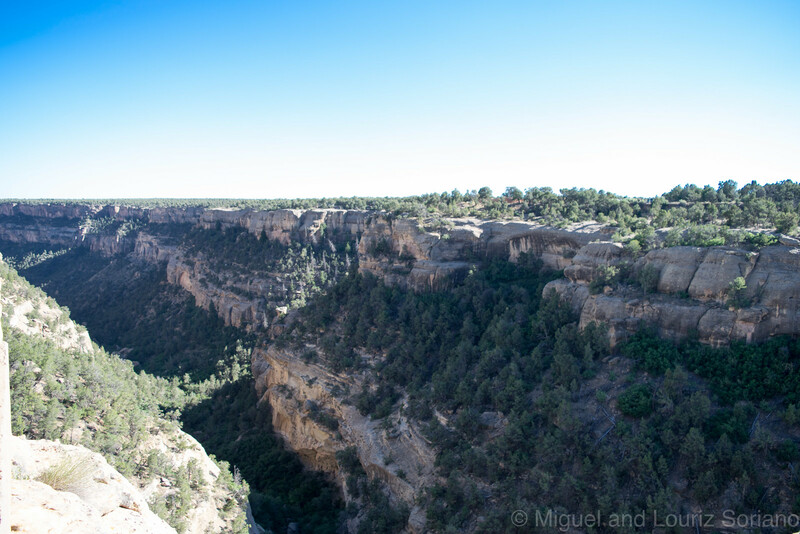 Mesa Verde National Park is the largest archeological preserve in the United States. I think those of of us who have lived in the big city too long and tend to forget that North America did exist before the likes of Christopher Columbus and Steve Jobs. If you look closely at the photos below, you can see the guided tour group ahead of us and that will give you an idea of the size of this place. Archeologists believe that it must’ve been less like an actual single residence and more like a little, contained town during its heyday. Ancestral Puebloans lived in these dwellings from around 1100 A.D. to 1300 A.D, at which time the dwellings were abandoned for a yet still unknown reason. This particular site, Cliff Palace, wasn’t rediscovered until December of 1888. True story. Imagine those ruins covered in snow, abandoned and hidden for hundreds of years before being rediscovered. My inner-nerd is a sucker for eerie yet educational stories like that. At this point, I just want to say – park rangers are real-life heroes. Ours managed to single-handedly corral 30 people (including a handful of school-aged children) down the face of the cliff, through an 800-year-old archeological site then back up a narrow ladder out and to the top of the mesa without losing anyone and with as little possible damage to irreplaceable remnants of early American history. The park ranger gets all this done with a smile and disarmingly genuine enthusiasm which is hard to match at 6:00PM in the thin Colorado air. Kudos to all hard-working rangers out there. After visiting Cliff Palace, we headed back to the campsite. Our campsite was secluded and thankfully, surrounded by trees that provided plenty of shade from the July heat as well adding a magical, woodland element to the experience. Miguel is all for that magical woodland feel, as evident in previous trips. Side Info: As I mentioned in Day 1, there are separate entrance fees to Zion, Bryce and Mesa Verde National Park. It’s $30 per park for each private car, valid for 7 days. To save money and to make getting in and out of the parks easier, we got an Annual Pass (2016 The America the Beautiful-The National Parks and Federal Recreational Lands Pass) for $80. This covers all the National Parks etc. that charge entrance fees. 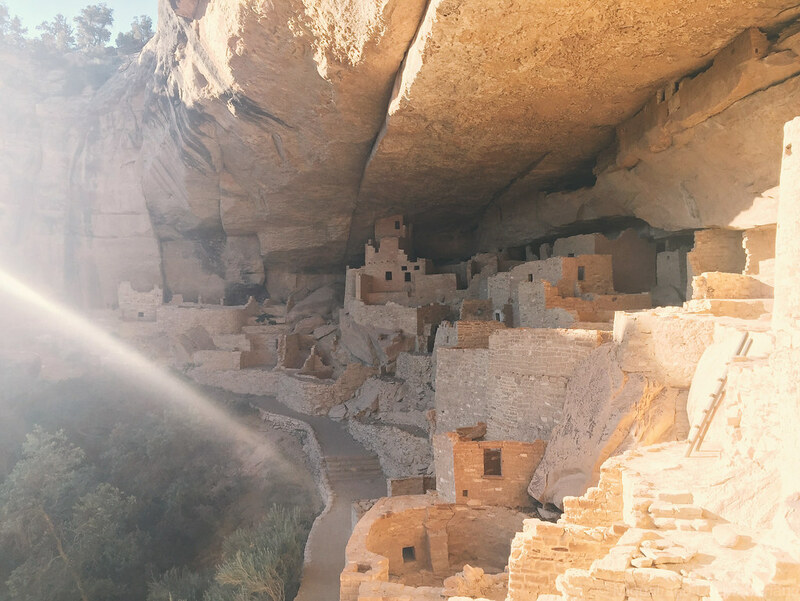 At Mesa Verde, our Annual Pass had already paid for itself. To camp at Mesa Verde’s Morefield Campground cost us $30 for a night and was not included in the Annual Pass. 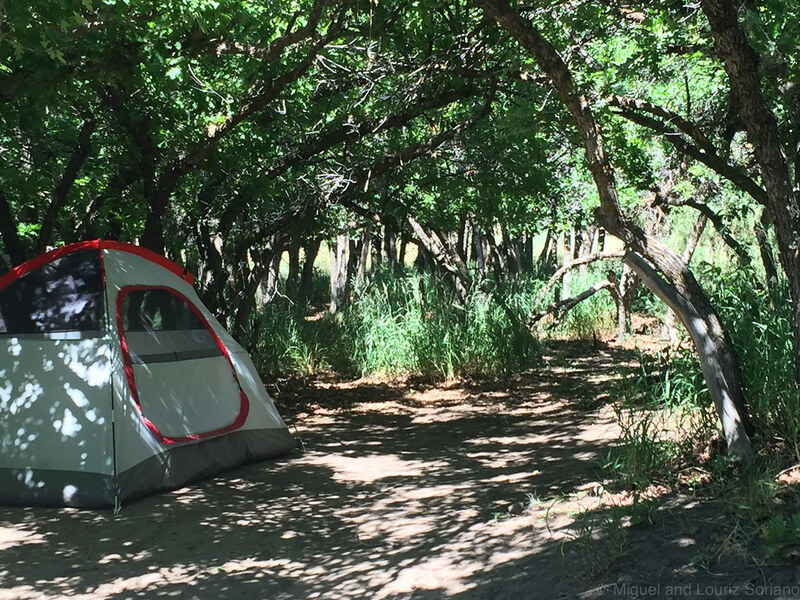 The campgrounds are managed by Aramark, with all the amenities within reach (nearby camp store, showers, cafeteria, even coin-operated laundry) while still keeping the actual campsites secluded and quiet. Some of you might like that. I did. With that, we end Day 2 // Running Total: 1011 miles (approx). Even with that very long post, we are still so far from Parkesburg, PA. But hush. Remember that glacial pace makes canyons my friends. Glacial pace. See you at Day 3. More posts on this trip coming up. We are not even halfway through!